Sleeps up to 5 people (approx. 70m2). Just 3 minutes from Colonia Sant Jordi's beaches. 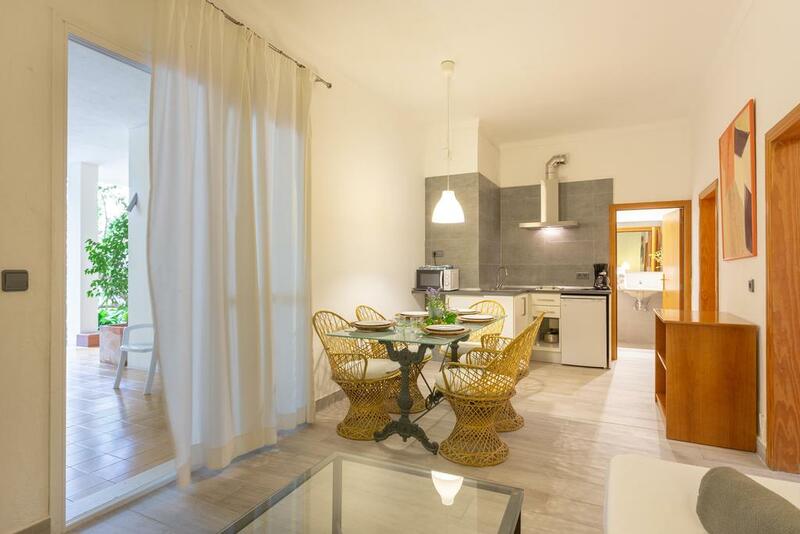 Apartamentos ESTANQUES in Majorca are completely refurbished. They are 2-room apartments with two single beds in each room (which can be put together) and a sofa bed in the living room. Each apartment sleeps up to 5 people. The apartments are approx. 70 m2 in size. There is a bathtub in the bathroom. All utensils you need for cooking and eating are in the kitchen. There is a television with international channels. There is a safe (additional charge of €10/week). A cot and high-chair are also available at no extra cost. There are ten apartments in total, spread among 3 floors (ground floor, first floor and second floor). The apartments have a large garden next to the entrance. The owners live in the same apartment block and will give you the keys when you arrive. They are available to help you at any time of day. The apartments’ classification is 2 llaves. 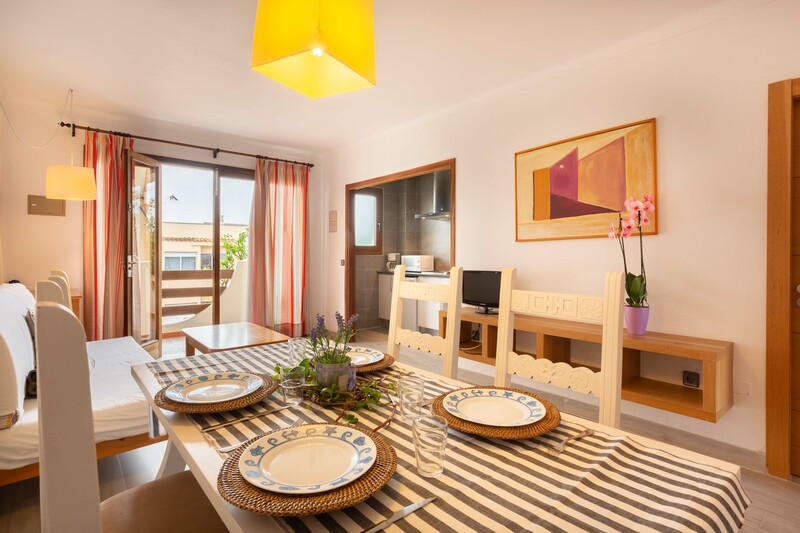 All of our apartments have views of the garden and a terrace at the back. The apartments are very bright and sunny. Cleaning is included in the price and is carried out twice a week. Towels and bedclothes are available. Towels are changed twice a week and bedclothes are changed once a week. (All of these services, as well as water and electricity, are included in the price). The apartments do not have air conditioning (although they are very well-ventilated) but they have Fans. There is not heating but heaters can be rented for €4/day (1500 W heater) or €8/day (2500 W heater). You can park your car for free on the same street where the apartments are located as well as in the streets close to the apartments. Blue markings do NOT mean that you have to pay for parking your car. The apartments have WIFI connection. Family rooms, Terrace, Room Service, Safe Reception services etc.